At Arnold Clark, we're committed to making sure your tyres are both safe and legal. It only takes a few minutes to check each of your tyres and taking the time to do so helps keep both you and your passengers safe. We can help. Just visit your local Arnold Clark Service department for a free tyre safety check and pick up a free tyre safety kit, which contains both a pressure gauge and tread depth gauge. Because your tyres are the only part of your vehicle that grips the road, the tread on your tyres is integral to the safety of your vehicle. Tread depth must be above the legal minimum which for passenger cars is 1.6 mm across the central three quarters of the tread around the entire circumference of the tyre. How can you check your tyre tread? Don't rely on guesswork - you can use a 20 pence piece to check your tyre tread depth as demonstrated in the video. Or, for a more accurate result, you can pick up a free tread depth gauge when you drop into an Arnold Clark Service department for a free tyre safety check so that you can continually monitor your tyres. We also offer free puncture repairs. 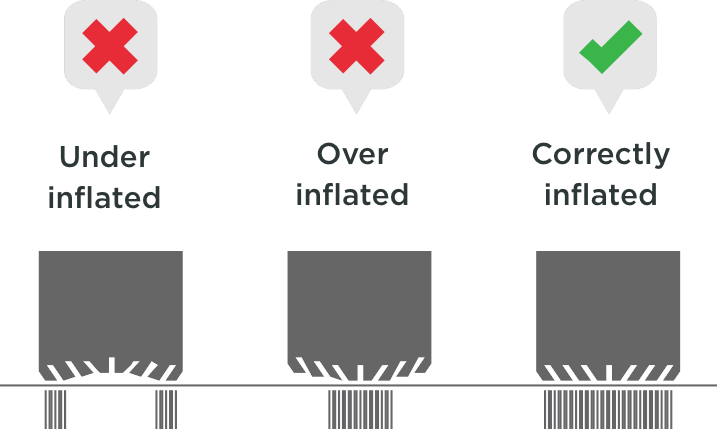 Tyres must be correctly inflated to the manufacturer-recommended pressure. Having your tyres inflated to the right pressure not only optimises your vehicle's performance, but also increases your personal safety while you're driving. You should check your tyre pressure at least once a month. The correct tyre pressure for your vehicle can be found either inside the petrol flap, inside the driver doorjamb or in your owner's manual. You can check tyre pressure at most petrol filling stations or using our handy tyre pressure gauge. If your tyre pressure is continually decreasing you can book a free health check at one of our Service departments, we can investigate, advise what the problem is and rectify it. Tyres should be compatible with the others on your car and in good condition. Tyre size, load and speed ratings should match the tyre being replaced and all other tyres on the vehicle. It's recommended that for the best possible performance, and to maintain the handling characteristics of your vehicle, you should use matching sets of manufacturer-approved tyres. If you're not sure about the compatibility of tyres on your vehicle, using our downloadable voucher you can bring your vehicle in for a free tyre safety check with no appointment necessary. You don't have to carry a spare tyre and it doesn't have to comply with the legal requirements while it is stowed away. However, when fitted to the vehicle (for example, following a puncture) it must then comply with the law. It may however affect breakdown cover if you don't carry a serviceable spare. Although it's not a legal requirement to carry a spare it can be costly and frustrating if you have a problem while on a journey and you don't have a spare or a repair kit with you. You might even void your breakdown cover by not carrying a serviceable spare, which you'd then have to pay for over and above the cost of a new tyre or wheel. View our most popular tyre options and get a bespoke, no-obligation quote for your vehicle. Just looking for a free tyre safety check? Download your free tyre safety check voucher. Book your free tyre safety health check now.